Copan is located in Western Honduras, approximately 60 miles from the Guatemalan border. Over the past two decades, the Honduran government has made this site into a beautiful national park that includes a museum. The area around the ruins is a mixture of thick jungle and tobacco plantations. The exact date that Copan was founded is still unknown. We do know that this great ceremonial center flourished during the sixth and seventh centuries. Although, the buildings of Copan are not as large or as aesthetically pleasing as those found in other Mayan cities, the finely detailed sculptures make Copan famous. Copan, in fact, has supplied the worlds museums with Mayan sculptures for almost two centuries. This incredibly large volume of finely finished stela, alters, sculptures, temples, and pyramids make Copan an especially important site. Artists worked with ceramics, stone, and jade. Between 3,500 to 4,500 structures have been found in the areas in and around Copan. Especially, important here is the hieroglyphic staircase. Its 63 steps contain thousands of glyphs that tell the history of Copan. However, they have decayed so terribly over the centuries that they are impossible to decipher. The ball court at Copan has been completely restored. This court is the second largest in all of Central America. 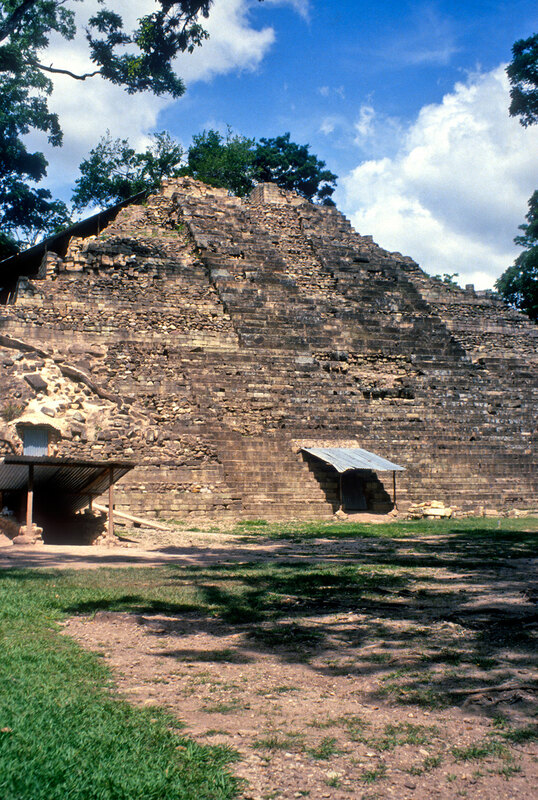 Copan has long been considered one of the centers of Mayan scientific achievement. It was especially strong in mathematics, calendrics, and astronomy. The most exact calendar ever found in the Mayan world was discovered here. This calender, which is almost exactly the same as today's calendars, also tracked Venus and eclipses. Copan was rediscovered by an attorney from the United States named John Lloyd Stephens in 1836. He was accompanied by Frederick Catherwood an English artist and architect. Both were students of antiquities. After, extensive jungle travel in hostile surroundings they found themselves in the midst of wonders that exceeded their wildest imaginations. Scattered everywhere were fallen alters, carved masks, animal figures, and human figures. Giant pyramids rose above the trees, and grotesque sculptures of jaguars, snakes, and mythical creatures had fallen from their facades. It was obvious to them that this had once been a highly advanced society of great artistic and intellectual achievement.